Pop. 40. In Renfrew C. on the Madawaska R. and C. Rds. 514 & 515, 32 km SE of Barry's Bay. Pop. 284. In Raglan T., Renfrew C., on the Madawaska R. and Hwy 515, 30 km SE of Barry' s Bay. The post office was named Palmer Rapids in 1872 after a farmer who settled in the area in 1848. Pop. 173. In Renfrew C. on a tributary to the Madawaska R. and C. Rd. 515, 34 km. SE of Barry's Bay. In Carlow T., Hastings C., 39 km NE of Bancroft. 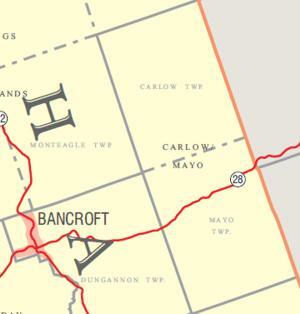 Boulter was the first post village in Carlow T., established in 1869. Pop. 50. In Brudenell T, Renfrew c., on Hwy. 28 and C. Rd. 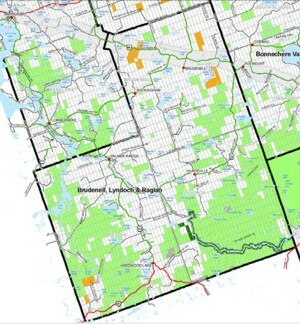 514, 42 km NE of Bancroft. 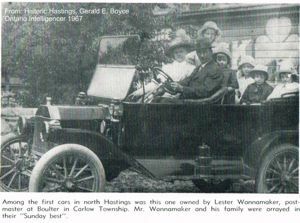 The place was called Beardwood, Harwood and Harrowood before being named Hardwood Lake. There are nine other Hardwood Lakes in Ontario. Pop. 298. In Sherwood and Hagerty Ts., Renfrew C., on Hwy 60 and C. Rd. 66, 10 km. NE of Barry's Bay. The community originated as a stopover point on the Opeongo Colonization Rd., which was largely completed by 1854.